I recently read Emily of New Moon in preparation for my paper that I’ll be giving at this summer’s upcoming “L.M. Montgomery and Reading” conference in PEI. This time was a re-reading, as I’d read this first book in the Emily triology as a child, as my thick, spine-creased 1998 Seal Book copy attests. Like other Montgomery readers, I didn’t fully appreciate the Emily books until I got a bit older. I’d much preferred Anne of Green Gables and the rest of the “Anne” books, reading them all first as a child, and then re-reading many of them in my twenties, sometimes several times over. But the Emily books had not been as appealing to me, and so I’d not re-read these as I had other Montgomery novels. 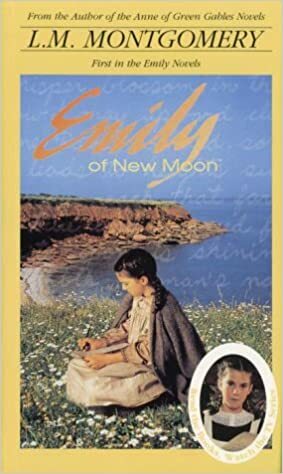 Now, this time through in my thirties, I very nearly skipped reading Emily of New Moon again, as I was much more interested in reading the later books about Emily’s more developed writing life (as I’d re-read the later books in the series). I don’t think I’d read Emily of New Moon since childhood. But I am very glad I finally did decide to re-read it. I recall specifically as a child having read that passage describing trees at twilight “like fine black lace.” Indeed, I couldn’t look at the trees across from my own childhood house at sunset and see anything else but black lace; there was just no other way to describe it. Not only was I surprised this time through to be introduced to Emily as a writer in the book’s first chapter, I was also surprised to discover how much creative nonfiction we are told that Emily writes. After leaving the home where she and her father had lived prior to his death, we told that Emily wrote in the garret at New Moon, where she wrote poetry, short stories, letters to “father on the way to heaven,” and, in addition to these, various sketches, images, scenes, descriptions, and other miscellaneous creative nonfiction in her “Jimmy-books.” Though we are not told that they are “creative nonfiction” by the narrator, or by Emily herself, it seems clear to me that reading the book now, that that was exactly what Emily was writing. Emily’s writing brought up a question I’ve had for some time of what the difference between life writing and creative nonfiction is. Is “life writing” (which is generally to be regarded as personal writing documenting a life, such as journals and diaries, but can also include autobiography) a form of creative nonfiction? Or, is it in a separate genre altogether? Where it gets hazy is with the memoir. Memoirs are regarded as creative nonfiction — they employ the literary techniques used by writers, and though they are often telling a single person’s story (or rather, an aspect of that person’s life), they generally are applicable or at least written for an audience other than oneself, which may be different from a journal or diary. And yet, a memoir also is close to a journal or diary, not in its dailiness, but in its recording of a life. As I read Emily of New Moon, I pondered these questions, along with being surprised at how much creative nonfiction Emily wrote in her “account book” and later, her “Jimmy-books” (given to her by a cousin at New Moon by that name). Indeed, Emily wrote a myriad of “descriptions” of people, and scenes, and places. And these descriptions and scenes which she recorded seemed to be more about the craft than recording her life. Furthermore, she seemed write them as true (not fictionalizing them), thus tending towards creative nonfiction. This passage strikes me not as one that a poet would describe but rather, an essayist. Was not Emily “detached” from the strong emotions of the scene — a necessary assumed position while composing creative nonfiction — and was “interestedly absorbing impressions and analyzing motives and describing settings”? Yes, it occurred to me when reading that Emily was more an essayist than a poet. And there are other passages similar to this. Later on, Emily admits that “I think maybe I’ll write novels when I grow up as well as poetry,” but even this movement towards prose does not negate the fact that Emily seems to primarily write her best work as an essayist. At least, it seems that way to me. Of course, I am rather biased reading this book, being an essayist myself, but I’d not remembered from my reading of it as a child how much Emily is documented having written nonfiction rather than poetry or short stories. And so it was a more complex Künstlerroman than I’d remembered it being: not a simple story of a poet’s early life (as I’d remembered it), but rather, a writer who tried all sorts of writing — including life writing and creative nonfiction — but who never seemed to acknowledge the literary value of these genres. Rather than reading the text at face value, I read more into it — perhaps even read against it — as it related to Emily as a writer. This re-read has made for a surprising and enjoyable read. Question: What book have you re-read with a different interpretation from the first time you read it? Great post! I loved “Emily of New Moon”! I read the Emily books last? year for the first time and the second was my favorite by far, but I really, really enjoyed the series. It actually had a sad overtone, I think, which after visiting PEI and reading more about Lucy Maud’s life, makes a lot of sense. I did not know some of the stuff you shared here. I knew generally that there was a bit of autobiography in Emily’s character, but that was the extent of my knowledge. Interesting questions and thoughts you raise about memoir/creative non-fiction/essays etc. I’m pondering it…I have no formal training in anything, really, and so it’s intriguing to read here and learn.